The two most popular Scallop species are Sea and Bay Scallops, a third less known specie of the Scallop family is the Calico, which is found along the South Atlantic and in the Gulf of Mexico. A scallop is a mollusk that propels itself along the bottom of the ocean by opening and closing its shell. The sweet, delicate meat that we eat is the muscle used to open and close the shell. 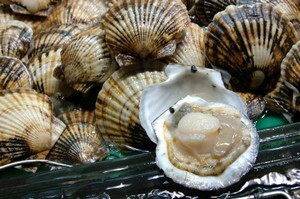 Both Bay and Sea Scallops meats are ivory white in color, but can have a orange tint to them. This orange tint can come for the algae they eat or it often comes from the pigment that is in the mature eggs, which are bright red-orange. So the adductor muscle takes on the orange tint. Obviously only egg-bearing females will have the orange coloration. The scallop is safe to eat. They should have a sweet distinctive aroma, with a firm, translucent color. The largest wild scallop you will find are the Atlantic sea scallop (Placopecten magellanicus) these are found mainly in deeper waters from Newfoundland down to North Carolina. 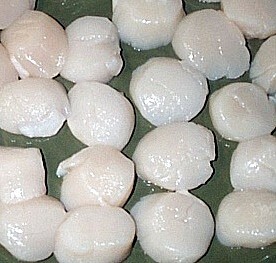 Canada is also a main source for sea scallops. Alaska has three types of scallops they include the bay, rock and the Weathervane (Patinopecten caurinus) scallops. The Alaskan commercial scallop fishery is very small, so you won't very many Alaskan scallops on the market and if you do they should be frozen and not sold fresh. Good retailers or fish markets should label scallops with the actual count of scallops per pound. Not just jumbo or large. Sea scallops can range from 10 to 40 per pound, common sizes that you may find in markets are 10 to 20, 20 to 30 or 30 to 40. Sometimes they will be labels u/10 or u/15, the "u" means under so a u/10 would have under 10 scallops per pound. Some sea scallops can be 2 inches in diameter, so when shopping remember that a 10 to 20 scallop will be close to the size of a half dollar. When buying Scallops make sure you are purchasing "dry pack," "chemical free,""day boat" or "diver" scallops. If you are buying frozen scallops, the label should tell you all of the ingredients of the scallops. Try to avoid any scallops, when the label also list a sodium tripolyphosphate (STP). You might also see scallops with a label that reads "Scallop product water added". The American Food and Drug Administration made some guidelines in the early 1990s:stating that any scallop product with 80 percent water or more should be labeled, "X% Water Added Scallop Product." Scallops normally have 75 to 79 % water. This phosphate solution is often used for soaking scallops. This solution makes them whiter, softer and plump looking and at the same time makes them absorb more water up to 25 %, which increases the weight of the scallops. So you end up paying dearly for the added water to the Scallops. Have you ever wondered why your scallops don't sear up as nice as the ones you get in restaurants or those mouth watering pictures you see all the time. One of the reasons could be of scallops soaked in phosphates. for instance when pan-searing this excess liquid will drain out of the scallops while cooking, so you start to steam them instead of searing. If you frying up some bay scallops the water comes out and can blow your breading off while frying. How do you tell if you are buying a soaked or a dry packed scallop? Most fresh scallops will be displayed in a bowl or a tray, if you see a lot of milky water in with the scallops chances are they have been treated. Also if they overly white and really plump this is another sign of soaked scallops. "Dry pack" scallops with be a little sticky and the color will be from a creamy ivory to a slight tan. It is common for them to have a slightly stronger scallop smell and expect to pay more for these too. Tip: If you are doing Bacon Wrapped scallops and can only find bays, you can put two or three scallops together and wrap in bacon for a more impressive look. These are found in bays from New England to the Gulf of Mexico. Smaller in size the muscle reaches a size of a half inch. Common market sizes for bays are 40-50, 50-60 and smaller up to 90 per pound. But 9 chances out of 10 the bay scallops that you will buy frozen, has come from China where they are farm raised.